The Hubble Space Telescope has helped NASA create a 4K video of the biggest planet in our solar system's rotation. This new video and accompanying images are part of a new series being put together by NASA that will profile the outer-lying planets in our solar system using the Hubble telescope. The new program, called the Outer Planet Atmospheres Legacy program, will focus on different planets each year, starting with Jupiter, then Uranus, Neptune and Saturn, and will allow scientists to study how the planets change over time. NASA also explained that the images captured by Hubble "confirm that the Great Red Spot continues to shrink and become more circular, as it has been doing for years." "Recently, the storm had been shrinking at a faster-than-usual rate, but the latest change is consistent with the long-term trend." Images also reveal a "rare wave" near the equator and a "filament-like feature" inside the Great Red Spot, neither of which had ever been seen before. 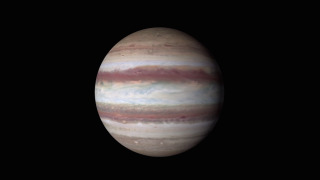 Check out the video of Jupiter below, which can be found on the NASA's new 4K YouTube channel.